During the World Championships Ultra Multievents in Lynchburg (USA) decathlete Joseph Detmer has broken the world record of double decathlon (icosathlon). The 27 year old set the new standard to 14571 points, an improvement of 386 points over Kip Janvrin’s old world record. 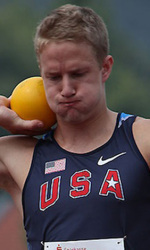 It is noteworthy that Detmer, with a personal best decathlon of 8090 points this year, scored an unbelievable 7741 point in the decathlon events during the icosathlon. its crazy how similar the numbers are accept the first 2 events for detmer and janvrin that is! Great effort by Joe Detmer!